To implement the project, Alimjan Saparov received a soft loan with a 14% rate. Repayment of the loan will be carried out at the expense of profits from the operation of stops. 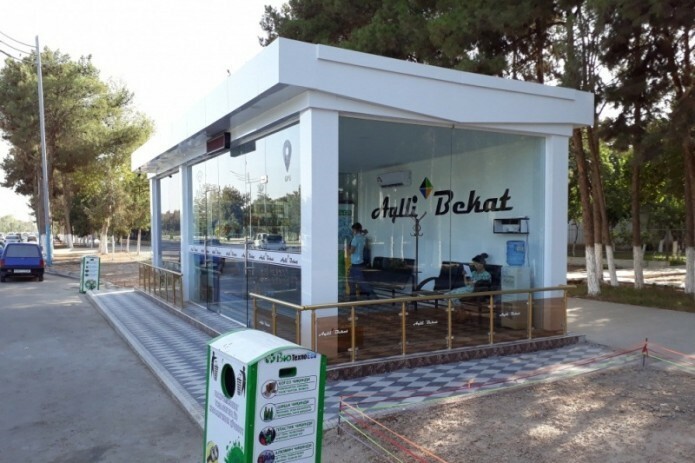 The 28-year-old entrepreneur from Surkhandarya Alimjan Saparov built an innovative public transport stop in Termez. To implement the project, Alimjan Saparov received a soft loan with a 14% rate. Repayment of the loan will be carried out at the expense of profits from the operation of stops. Currently, 2 stops have been built and put into operation, in the future it is planned to increase their number. These smart stops have a number of necessary conditions for passengers: air conditioning, information board, ambulance service, emergency information communication panel, sensor environmental monitoring, free Wi-Fi, video surveillance, as well as USB power. Each stop has a solar panel, capable to provide lighting and USB auxiliary power.